Cable railing can clean up your view and add a statement to your dock or deck. Our cable railings are clean and need no maintenance will add to your deck appeal. This deck in Gulf Shores turned out great. With new handrails and our deck sealer; our cable handrail system will last a long time. All of our fasteners and cables are 316 stainless for the durability necessary for our harsh conditions. Whether you just want the cable railings installed or a whole deck makeover; we are the deck builder for you! Don’t forget about your dock this winter. We can do your dock repairs and have you ready to go for spring. Looking to spice up your outdoor space we also offer shade sails for those hot summers or extra added privacy. Built from Sunbrella material we can custom design any area to meet your needs! Have a outdoor cooking area? Tired of the mess under your grill? Ask us about Sure-Step custom grill design that keeps your new or existing deck mess free and clean up a breeze! . 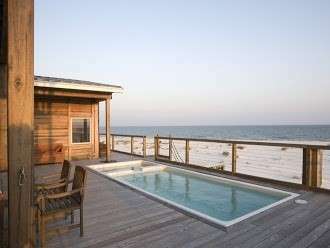 Check out our website www.dockanddecks.com for our monthly specials. Give us a call today for free estimate. Dock and Decks Marine Contractor for all of Baldwin County including Gulf Shores, Foley, Orange Beach, Perdido Bay, Fairhope, Daphne and Elberta – Building the Best Fixing the Rest! Share the post "Deck Cable Railing – Foley, Orange Beach, Gulf Shores, Elberta"